New Jersey governor Chris Christie is out with a brand new tax plan. Well, perhaps “plan” is too strong a term – it’s more accurate to say that he’s written a lot of words about taxes in an op-ed for the Wall Street Journal, and some of those words could conceivably form the basis of a tax plan should Christie decide to run for president in 2016. And the overall message of Christie’s tax vision can be summed up in one word: Reagan. Let’s lower the rates for every American by simplifying the income-tax system to just three individual income-tax rates, instead of the current six. The top rate should be no higher than the 28% set in the country’s last major successful tax-reform effort—the Bradley-Gephardt reform during the Reagan era. And the bottom rate should be a single digit. Well that’s certainly vague! 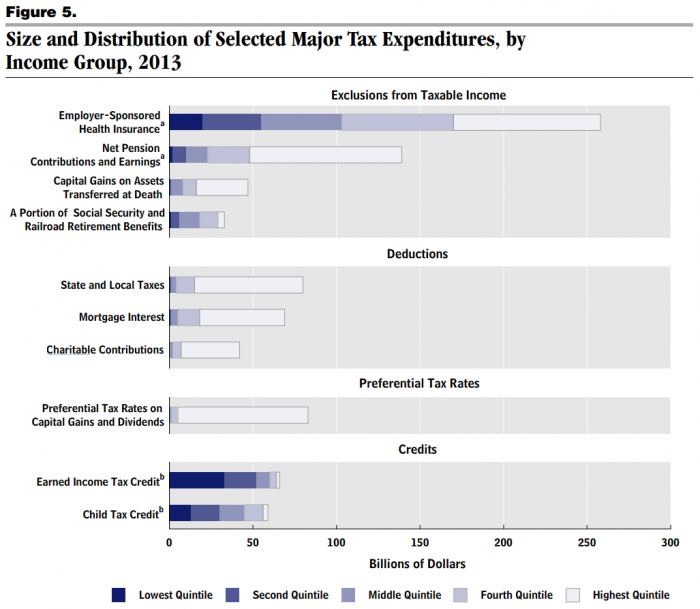 Of course, he does single out two specific deductions that, in his view, shouldn’t be touched: “The deductions for charitable contributions and for interest on home mortgages—at least for a first home—should remain intact.” These two deductions overwhelmingly benefit top earners, as this handy-dandy CBO chart demonstrates. So, the Christie tax plan is to slash rates for the wealthy and preserve government handouts for top earners. Congratulations, rich people! You win again! Finally, these past six years have seen a weak economy combined with a set of monetary policies that were geared for the wealthy, exacerbating the very problem the left loves to harp on: income inequality. The best way to address income inequality is to nurture overall growth. Incomes for most Americans grew during the economically healthy 1980s and ’90s, and inequality increased during the anemic 1970s. Oh there’s just so much to disassemble here. If lowering tax rates is the key to inequality-busting economic growth, then why is Christie talking about income growth during “economically healthy” 1990s when the top tax rate was at the current, unacceptably high level of 39.6 percent? Also, the suggestion that income inequality didn’t worsen during the ‘80s is completely blinkered. “Incomes for the poorest quintile (i.e., the poorest 20% of the population) rose, on average, by only 0.7% under Reagan,” wrote Timothy Noah in 2014, “while incomes for the richest quintile rose, on average, by 23%.” Ever since the late 1970s, the wealthiest Americans have been vacuuming up a steadily increasing share of national income, with only the odd recession here and there serving as a speedbump to the concentration of wealth at the top. Christie’s policies, such as they are, would only make it easier for the wealthier to accumulate even more wealth, just like they did under Reagan. And really, it’s laughable for Christie to be talking about economic growth to begin with, given that his own state has lagged behind badly on that very score under his five-year stewardship.